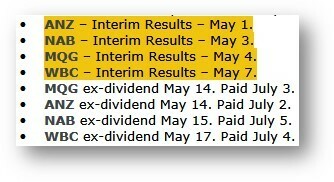 The ANZ, NAB, WBC and Macquarie report results next week and will go ex-dividend shortly after. The sector is on its back, and for a variety of reason, one of which is collecting as much franking as possible before Bill Shorten buggers it all up. Then this looks like as good a moment as any to consider a bet on them bottoming. Buying now is a bet on the results being neutral at worst and good at best. Hopefully, the results will highlight the value in the sector. Results will also de-risk sector earnings forecasts for three to six months and will hopefully sober us up to the sector and put the focus back on “value” rather than sentiment. Here are the numbers. The majors are yielding 8.4% to 9.7%. At the sector peak, sector yields can drop to 6%. The PEs range from 11.7x to 13.1x. At the sector peak, they can hit 15-16x (up over 20% from here). Royal Commission moves on - At the peak of a storm, by definition, the weather starts to improve. The sector has been in a massive sentiment storm created by the Royal Commission enquiry into the financial sector (note: the financial sector not the bank sector). 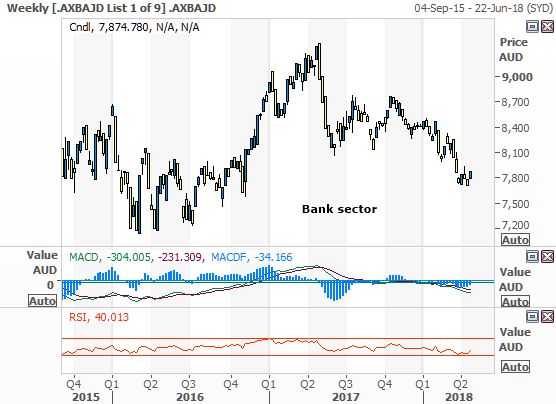 That has left the sector in a sentiment hole (as opposed to an earnings hole) and as the Royal Commission starts to move its focus from the banks to financial planning (which is a business the banks are getting out of), the negative sentiment will hopefully start to dissipate soon. Billions are waiting – When the sector does finally look like bottoming, even in the short term, the brokers will be screaming BUY because if they don’t, they are going to miss out on a lot of commission. They earn 25% of their annual commission a year. It is a competition. If one broker starts to thrash about some BUY recommendations in the sector, the others have to follow or miss out. The only reason the banks are not seeing billions of dollars invested is that despite their 9- 10% yields, income-focused investors are scared of losing money. Then imagine how much money would be invested at these prices if those investors knew the share price wouldn’t fall anymore. Now imagine how many billions would be invested if there was a good chance of a capital gain as well. Catching the bottom on the sector is one of the biggest games in town, and when it starts, the brokers will be all over it because 25% of their annual commission take is in four stocks. 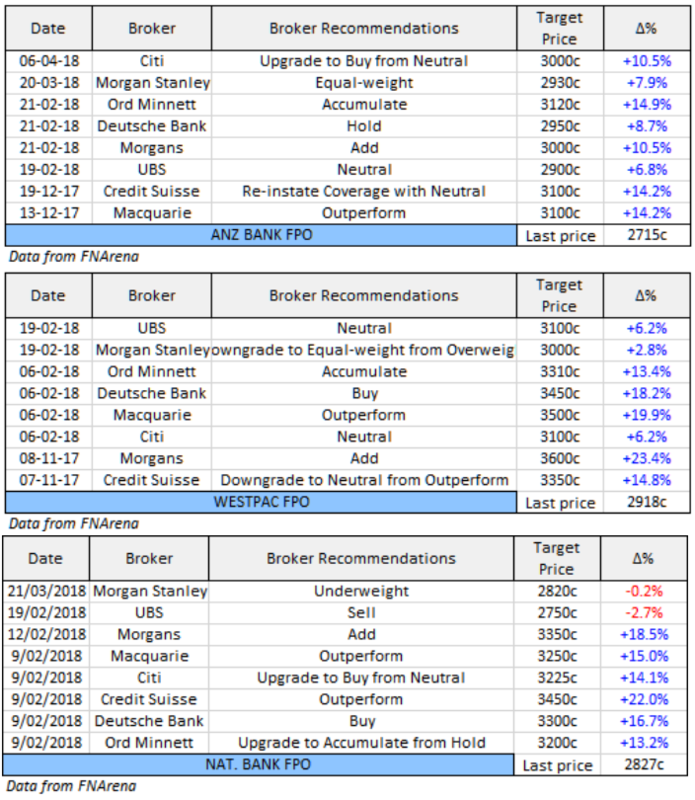 Broker Recommendations on ANZ, WBC and NAB - Here are tables of the most recent broker recommendations on all the major banks coming up to results. You can see that apart from a couple of brokers on NAB they all consider the banks to be undervalued, in some cases quite significantly. For stocks that are not that volatile 20% plus gaps between share price and broker, valuations tell you that this is a sector in a sentiment hole with room to improve once that sentiment turns. The Chart - Technically the chart of the bank sector is not screaming “BUY”, but it is saying the downtrend momentum is easing and there is a bit of a base forming. This is the weekly chart showing an RSI buy signal in the last couple of weeks and MACD (momentum of the downtrend) waning. Footnote: You can avoid the risk in this idea by waiting for the results next week. If they are OK you will still be able to buy the stocks before the dividends go ex. "......... the brokers will be screaming BUY because if they don’t, they are going to miss out on a lot of commission." In view of the current Royal Commission, I was surprised to actually see this put in writing, though having dealt with stockbrokers for over 40 years, and long been cynical about their recommendations, I'm not doubting it for one minute. Am I correct in assuming they are exempt from FOFA 'putting clients first' requirements? Hello Marcus, thankyou for the article, interesting. When you refer to "Broker Recommendations on ANZ, WBC and NAB "What date is the "Target Price" column referring to?